First week in June was Queen’s Park FC Sports, Third in June was the Glasgow Police Sports, fourth week in June was the SAAA Championships, First week in July was the Partick Thistle Sports, third week in July was Clyde FC sports – but they were for a time a professional games and they only reverted to the amateur code in 1935, first week in August was Rangers sports. There were others – Monkland Harriers sports on last week in May, Greenock Glenpark Harriers were on the last week in July – an so on. There was an opening on the second Saturday in July when the football season made the change necessary, but after the first CFC meeting, the organisers of the Triangular International changed the date of their fixture from June. The Celtic meeting as a major fixture was almost certainly doomed from that date. This page is to give some idea of the size of event that they hosted – for instance, they always needed a follow-up or supplementary meeting on the Monday after the Saturday; there were many heats in the sprints – over 20 was not uncommon and 25 were known. We have only a brief coverage of each sports from 1900 here but they should give an indication. The supplementary meeting on the Monday was held in fine weather with a crowd of 10,000 spectators – an excellent attendance for an evening meeting and maybe a testament to the quality of the Saturday event in the rain. The feature of the meeting was said to be the running of the American runner M Long but my attention was drawn to the winner of the fifth Heat of the open 100 yards – AS Maley (running for Celtic FC) off one and a half yards. There were no fewer than thirteen Heats of the 100 yards, Maley was second his semi-final, and won the Final. There were eight Heats in the 220 yards which was won by Long. The runner who was third in the six laps steeplechase was also running for Celtic FC. The programme also had men competing in the colours of Queen’s Park FC, Royal Albert FC and Annfield FC. 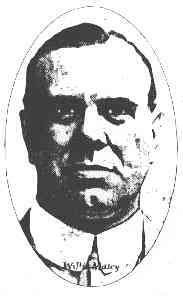 On the Monday before the 1901 meeting, the ‘Glasgow Herald’ again remarked on Maley’s efforts. “The Celts make their annual athletic appeal on Saturday first, and from the elaborate arrangements made by Mr William Maley, they are not likely to appeal in vain. The American runners are the trump card this season, as they were last, and the recollections of Maxwell Long’s brilliant quarter-mile running last August should make all who saw him on that occasion anxious to see him again. He does not come arrayed in English championship honours, as he did a year ago, but for all that his reputation is as great now as it was then. Long is one of the pedestrian marvels of the present day, , and so too is A Duffy, who has been described as “the greatest sprinter in the world for his inches”. Duffy could not come to Glasgow last August but he is a certain starter this weekend. He will run in the 100 yards open, while it is just possible the Celts will put up an invitation handicap for the American’s special delectation. Duffy will teach Scotch sprinters how to start and if his example in this important matter is to be followed, we shall have faster sprinters than at present. R Wadsley who is running at the Exhibition tonight, having arrived in the city from Manchester yesterday evening, may remain over for the Celtic Sports, and if he does, he and Long may meet in the quarter-mile handicap, in which case we will have the English championship battle all over again. All round the entries are large and influential, even more so than in the case of Rangers on Saturday, and there should be some good sport.” The report continued to list some of those who would be competing and in general the article may well have helped attract at least part of the crowd. Held on 10th August 1901, the Celtic Sports in the opinion of the reporter for the ‘Glasgow Herald’ would have had an even greater crowd than the previous year ‘but for the breakdown in the weather’ – as it was the attendance was estimated at 15,000! Again there were Americans, Irish and English competitors as well as domestic Scots including the great John McGough of Bellahouston Harriers. From early in the report: “It has been said by one whose opinion in athletic matters is valued highly that the Celtic meeting is the greatest in the country, and with the recollection of many fine gatherings which the club has celebrated, we are not inclined to question the verdict.” What was in the meeting in 1901 to occasion that kind of remark? A Duffy the American sprinter who had been invited in 1900 but had failed to turn up, was there and he beat Denis Murray of Dublin by half a yard in 10.4 – a disappointing time but he was running on sodden grass. There were 23 heats (twenty three) Heats of the 100 yards; the heralded American Maxwell Long won his Heat of the 440 yards but did not turn out in the Final ‘fearing a breakdown’; Baxter, the American high jumper gave an exhibition; N McIntosh (Maryhill Harriers) won the mile from John McGough who was conceding 60 yards. McIntosh was competing the previous year as ‘Celtic FC’. As before, there was a top-up meeting on the Monday evening with 9 heats of the 220 yards and last year’s 100 yards winner, AW Maley – was second after leading most of the way. There were also several athletes racing in their football club colours, among them Clyde FC, Annbank FC, Hamilton Academicals FC. In 1902 the sports were on 9th August, the sports seemed to go off well, but there was only a vestigial report – they fell at the time of the Coronation of King Edward and the crowning of Queen Alexandra and the sports coverage was minimal with athletics possibly the most minimal of them all. It could have been worse – the Rangers Sports were cancelled. The papers were full of the coronation with pages of coverage, line drawings, diagrams, reports on all the celebratory activities. The Herald for example had four or five broadsheet pages of reportage plus a couple of pages with short pieces covering the celebrations in many towns and villages throughout Scotland. There was great competition for the attention of the ‘man n the street’. Celtic had been hoping for Alfred Shrubb to come north but he had apparently already agreed to compete in fixtures nearer home. The reporter pointed out that distance runners were very popular than sprinters in these parts “no doubt due to the fact that they give better value and more sustained excitement” than sprinters. The 1903 sports were held on 8th August – 24 heats of the open 100 this times – with a total of six track events and four field and a total of £700 drawn at the gate. The standard was high with, eg, Tom Nicolson against Denis Horgan of Ireland in both weight and hammer and an international high jump competition. Coverage was limited to a couple of lines plus results but it was another very successful meeting. The follow-up meeting was on Monday, 10th, and not only were there athletic events + cycling but there was motor cycling events in which the Scottish one mile record was broken. On to the meeting on 14th August, “The Celtic Football Club on Saturday added another to the many splendid honours they have to their credit as sports administrators. One, in fact, is left to wonder what the attendance would have been had the weather conditions been a little better. It ruined more or less all ? , and at one time it looked rather bleak for any form of outdoor recreation, but about two o’clock there was a change for the better with the result that crowds flocked to Parkhead and it is estimated that attendance was not much under 30,000 which is a tribute to the stature of Celtic Sports.” The fields were made up mainly of Scots with some good Englishmen taking part, many good races were held although no records were set. On the Monday meeting, held in better weather, also had some top class competition with the invitation 100 yards being won by the American AF Duffey ‘by inches’ from JW Morton of England in 10.6 seconds. R Craig of Bellahouston Harriers won the 1000 yards race won by about two inches in a field of 50 runners. 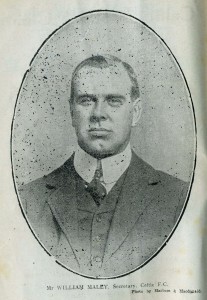 Duffey was considered the fastest man in the world at the time and had been encouraged to come to Scotland by William Wilton of the Rangers in 1903 for their Sports the previous week. Duffey had been favourite in the 1900 Olympics but despite a good run in the Heats had to pull up in the final with an injury. American 100 yards champion in 1899, he won the AAA’s in England every year from 1900 to 1904. He ran 9.6 for 100 in 1902, a world record, but after a quarrel with the AAU over his refusal to wear Spalding running shoes he was found guilty of breaking the amateur code. There is genuine dispute over this verdict – the AAU President worked for Spalding Shoes and it was after the refusal to wear these that the President himself brought the accusation that Duffey had been accepting illegal expenses every year since 1899. There seems to be little if any evidence that he did actually do a bad thing! However, when he came to Ibrox in 1903 and Parkhead in 1904, he was still a world class athlete. There were also cycle races and a motor bike race. I don’t know of any other meeting during the period that actually had motor bike races at their sports but then maybe the aforementioned cement track was used for these. That is the report in its entirety and the preview of the Monday meeting concentrated on the Four Miles Handicap. “We are to have A Shrubb in a Four Miles Handicap and that is something which is not seen every day. Two years ago Shrubb ran a very fine race at the Celtic enclosure, the occasion being the summer sports of the West of Scotland Harriers, when he created record, 19 mins 32 2-th sec, which he afterwards lowered at Ibrox to 19 min 23 2-5th sec, in the historic ten miles race. We are not likely to have either of these efforts repeated tonight, although we shall be surprised if the Englishman does not crack 20 minutes. Last week on grass he was quite at his best, beating Alridge quite easily over four miles, and as this is the distance he favours most, we feel confident he will put in a performance worthy of the great name that he enjoys. There are twelve entrants, distributed as follows: J McGough, Bellahouston Harriers 100 yards; S Stevenson, Clydesdale Harriers, 120 yards; PC Russell, Bellahouston Harriers, 230 yards; G McKenzie, West of Scotland Harriers 320 yards; T Robertson, Edinburgh Harriers 390 yards; J Reston, Clydesdale Harriers, 400 yards; WJ Elliott, Herne Hill Harriers, 420 yards; R Craig, Bellahouston Harriers, 430 yards; WG Kerr, Clydesdale Harriers, 430 yards; T Stewart, Springburn Harriers, 450 yards; J Stewart, Maryhill Harriers, 450 yards; J Mullinch, Bellahouston Harriers, 470 yards. In other words, Shrubb is asked to give away a lap and 30 yards which is a very formidable task.” The 220 yards featured English and American runners as well as Scots and was also previewed fairly extensively. It should be noted that among the runners in the Four Miles were two past or future Olympians in McGough and Stevenson and several Scottish cross-country internationalists including James Reston who emigrated to the USA in 1920 and was the father of the great American political columnist James Scotty Reston. After that the race had to be good. The headline the following morning read: “SHRUBB AND McGOUGH IN GOOD FORM.” and the article, although brief, reported on a good race. The amateur athletic sports of the Celtic Football Club were continued last night in fine weather and before a large attendance attracted by the entry of several English cracks. Principal interest centred in the Four Miles flat race handicap in which Shrubb, Butterfield and McGough met. An exciting race was witnessed. The London runner was in grand form, and starting at once to draw in his men succeeded in passing McGough when two miles had been covered. Half a mile short of the distance, Butterfield had retired owing to the muscles in one of his legs stiffening. After he had taken the lead of the Bellahouston man, Shrubb went straight ahead and got into first place at the end of two and three-quarter miles. He won in 19 mins 34 seconds by fully 100 yards from McGough who completing the four miles put up a record for a Scottish runner of 20 min 6 1-5th sec, the previous best being 20 min 10 3-5th sec.” The evening saw 16 heats of the 100 yards and 8 heats of the 220 yards as well as two cycle races. Home Scots won the sprints. If 1905 was good, 1906 was better. Held on 11th August, the report was headlined “CELTIC CARNIVAL”. The headline act was Lieutenant Halswell but the reporter was in no doubt about the place of the Celtic FC meeting in Scottish athletics. “All roads lead to Parkhead on the day of the Celtic FC Sports. Glasgow people seem to have got it into their heads that all worth seeing in athletes and athletics are to be seen as they are seen nowhere else, at the meeting of the Celtic Football Club. This is eminently flattering to the Parkhead management, though at the same time it is hard to say the least on such clubs as Clydesdale Harriers, West of Scotland Harriers and Bellahouston Harriers, all of whom in their own modest way have done, and are still doing incalculable service in the cause of athletics advancement in the city. There was a great variety of events on Saturday: if anything the programme was a little too rich in good things. An Epoch Maker Lieutenant Halswell was the “magnet” and it goes without saying that he rose to the dignity of the occasion. He gave no fewer than three very noble turns, all of which were greatly appreciated, though of course the one that caught the fancy most was the 49 sec in the quarter mile, which is three-fifths better than his previous accomplished if we mistake not, in the West of Scotland Harriers June Sports at Ibrox Park. Halswell on Saturday could have easily given the concessions that proved too severe for him at Ibrox, so full of life was he at the finish. He was also second in the invitation 100 yards off one and a half yards, and was just defeated in the half-mile scratch by George Butterfield of Darlington Harriers in 2 min. It was the brains of the latter that triumphed in this race and if Halswell knew as much of the science of running as the AAA mile champion, his efforts, great as they are, would be even greater. Butterfield, for instance, would never have courted the jostling that ruined Halswell’s prospects in this race. All the same, the Lieutenant is a fine athlete, and there is not, we are safe in saying, another runner, be he amateur or professional, who could do what he did at Parkhead on Saturday with apparently so little exertion. Halswell’s 49 sec here is equal to 48 sec in England, and the magnificence, as well as the significance, of the performance can only be appreciated by those who are in a position to contrast the conditions in Glasgow with those in the South of England. We are afraid Halswell will not succeed in breaking world’s record in Scotland, and for the fruition of his ambition he should go to London before the season ends. One who has accomplished so much already should not stop till he has erased the present world’s record for the quarter. There is a rumour that he is retiring from the path tonight, but this is not true as he has applied to the AAA for permission to run at Christiania, Norway towards the end of the month and it may be taken as certain that he will represent the rest of Scotland against Scottish Universities at Aberdeen on the occasion of the King and Queen’s visit to that city in September. What will happen afterwards will be determined by military considerations. The report continued with coverage of the sprints but the big events had clearly been the endurance races mentioned above. As for the Monday session, the sport was good, the crowd was large and appreciative but no records were set. The crowd numbers quoted for these meetings generally are astonishing to the present day athletics supporters – in 1907 there were 20,000+ spectators over the Saturday afternoon and Monday evening events. The numbers competing are no less surprising – at times over 100 in a mile handicap, 25 or more heats of a good 100 yards. Some say that Scots today ‘love their sport’ but that generally means they love watching football. This was the first time that Celtic had 5-a-sides at their athletics meetig and the crowds were not really appreciably bigger than in previous years. Have we really more to do with our time these days? Is the publicity and ‘selling of the events’ less than it was then? Is athletics less entertaining? The Rangers Sports at this time also had two meetings – the big Saturday one and the supplementary on the Monday with a couple of featured races and a restricted programme of, in the main, local events. The net result was a wonderful ten days when the Glasgow citizenry had the Rangers Sport on the Saturda and the Monday followed five days later by the Celtic Sports on the Saturday. Normally there would have been a fourth session – the Celtic Monday meeting – but in 1908 for some reason this did not happen. The success of all these meetings in the London Olympics year of 1908 was noted in an article praising the efforts of both clubs to provide top-grade entertainment. Last week was a memorable one in the sporting history of the city, [reported the Glasgow Herald of 10th August 1908]. On Monday the Rangers FC concluded what from every point of view had been the most successful meeting that they had held for a very long time, while on Saturday Celtic FC added one more to their brilliant list of triumphs. Both are in the fortunate position of having money to spend, and money judiciously handled will yield, as we have just seen, as big a return from athletics as from most forms of public amusement. That there was more lavish expenditure this season than previously is frankly acknowledged by the two managements and, without pausing to inquire how this sort of thing squares with official notions, we would merely mention that the Glasgow public has much to be grateful for to the Rangers and Celtic for introducing so many of those who distinguished themselves at the recent Olympic Games. But for those clubs it is just possible that we might never have had the privilege of seeing Melvin Sheppard, Reginald Walker and others who, by their achievements at the stadium, have enrolled themselves in the lists of the immortals. All are agreed that good as the racing was at Ibrox on the first day, it was infinitely better on Monday evening. General excellence took the place of individual excellence for the greater part and, after all, there is a greater source of satisfaction in this than in the creation of records, the one being the gratification of personal ambition, the other being the manifestation of universal competitive interest. It is difficult to say whether Reginald Walker’s win in the open sprint or Sheppard’s win in the half-mile was the finer effort. Both are monumental in that the time in the sprint is likely to be bracketed with JM Cowie’s record of 10 sec while Sheppard’s half-mile will rank as one of the finest ever witnessed in Britain and its significance is greatly enhanced by the fact that for a third of the distance he may be said to have cut out his own pace. It was however a disappointment to many at Ibrox that that he did not run in the handicap specially prepared for him. Those who saw Walker’s finish in the final of the 100 yards handicap will never forget it. At 20 yards from home he seemed hopelessly beaten but with a supreme effort managed to break the tape first. ….. There was a total of 11 running events plus cycle racing plus several field events on the programme. The comments on the money available to the two clubs and the comment on how ‘money judiciously spent squares with official notions’ is a leading one. The meeting on 14th August 1909 was held under a cloud: Mr McLaughlin, the Celtic chairman who had been a key figure in organising the sports had died and there was talk of cancelling the meeting. It went ahead because there were several English runners who had travelled a long way to compete. It was nevertheless a low-key affair with the top men being Cartmell, Rodger and Tom Jack. Having come from 1900 to 1910, we will soon start a new page for 1910 to 1920 but it is clear from the little reported here that the Celtic FC Sports were major events that attracted some of the top athletes of the day to Parkhead.